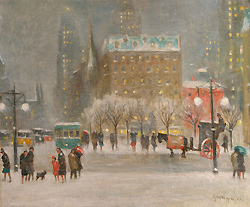 Guy C. Wiggins was born in Brooklyn, New York, in 1883 and then traveled to England with his family as a boy where he received his early education. He was the son of Carleton Wiggins, an American painter in the Barbizon style who studied with George Inness and admired Anton Mauve and Dwight Tryon. The Wiggins family had been early and regular visitors to the Old Lyme Colony, and by 1915 Carlton Wiggins had settled in Lyme permanently. He became active in the Lyme Art Association and in the social life of Old Lyme. Carleton Wiggins' palette had brightened under the influence of Old Lyme Impressionism, but in general his work remained tonal and his subjects were truly pastoral, his paintings often of sheep in a meadow. 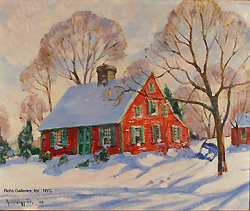 Conversely, his son Guy Wiggins studied with artists in the Old Lyme Colony who were developing their own style of Impressionism, combining both French traditions and emerging American techniques. He became strongly attracted to Impressionism and stayed with it long after it was considered outmoded and in 1920, he and his family also decided to settle in Lyme. They remained there for the next twenty years when they relocated to Essex. Earlier, after returning to America in the 1890s, Guy Wiggins first studied architecture at the Polytechnic Institute in Brooklyn, and then later transferred to the National Academy of Design, where he would study painting, first under William Merritt Chase and later under Robert Henri. He developed a life-long relationship with the National Academy. Wiggins became extremely successful early in his career. At the age of twenty, he was the youngest artist to have a work in the permanent collection at the Metropolitan Museum of Art. 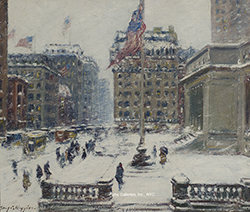 He was elected to full membership in the National Academy of Design in 1935 and had already begun to receive many awards, such as the prestigious Norman Wait Harris Bronze Medal from the Art Institute of Chicago in 1917. Throughout his life, his list of prizes continued to grow. Wiggins was especially busy in the years before World War I. He worked on commissions from New York patrons for scenes painted "on location (Morning, Gloucester)” in England, where he met his wife. He somehow still found time to be at Old Lyme and exhibit there. Furthermore, he became involved with the Connecticut Academy of Fine Arts, which had been established in 1910. 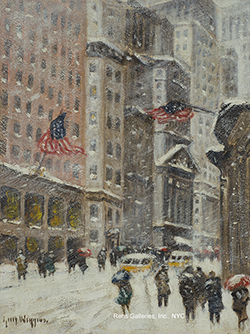 He won prizes from the Connecticut Academy of Fine Arts, the Salmagundi Club and the Art Club of Philadelphia. By 1920 Wiggins had decided to make his home on an old farm in Hamburg Cove, a charming area in Lyme Township, however, he still spent time in New York. 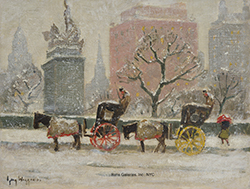 In an interview published in the "Detroit News" in 1924 (specific date unknown), he talked about his New York snow scenes: One cold, blustering, snowy winter day (1912) I was in my New York studio trying to paint a summer landscape. Things wouldn't go right, and I sat idly looking out of a window at nothing. 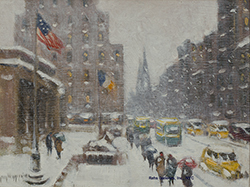 Suddenly I saw what was before me---an elevated railroad track, with a train dashing madly through the whirling blizzard-like snow that made hazy and indistinct the row of buildings on the far side of the street ("Metropolitan Tower, 1912" Metropolitan Museum of Art, NY). Well, when I gave an exhibition a short time afterward . 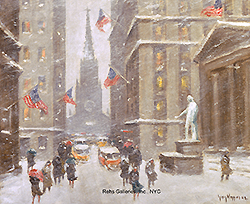 . . the winter canvases were sold before anything else. 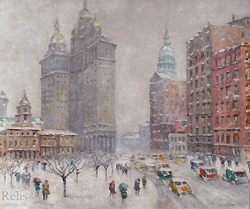 In a week, so to say, I was established as a painter of city winter scenes, and I found it profitable. Then suddenly I felt a revulsion against them and I stopped. Everyone said I was a fool and was shutting the door upon opportunity, maybe fame. Just the same I couldn't go on with winter stuff and that was all there was to it. 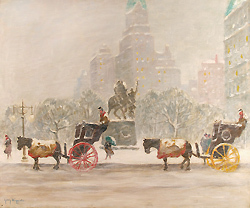 Connecticut landscapes and New York snow scenes are about equal in number in his work, and comprise most of it, the pastoral quality in parts of our state clearly appealed to Wiggins. Some say the Connecticut landscapes are his best work. 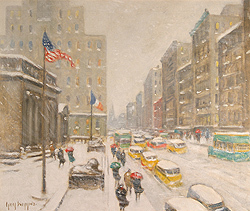 In 1930 Wiggins, though he still listed a winter New York address in the American Art Annual, he was advertising the "Guy Wiggins Art School: New Haven (winter); Lyme (summer)." 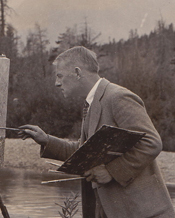 Hartford artist James Goodwin McManus often taught the summer classes with him at Hamburg Cove. In 1937, at the age of fifty-four, Wiggins who had relocated to Essex, moved his art school there year-around. He invited for his students' benefit such guests as George Luks, Bruce Crane, Eugene Higgins and John Noble. He formed the Essex Painters Society. Wiggins died while on vacation in St. Augustine, Florida, in 1962 and is buried in Old Lyme. People who knew him still talk about him as "the ebullient Wiggins." His artistic reputation surpasses both that of his father and of his son. The Little Red House, CT.